Firstly this month, a study in the journal Aging & Mental Health examining the association between refugee mental health, past traumatic experiences, and religious observance found that refugees with a higher level of religiousness did not show higher levels of PTSD after exposure to war trauma compared to those with a lower level. The authors argue that religious observance provides a buffering effect to refugees’ mental health from severe war trauma. 1. Shaykh Dr. Rafaqat Rashid hosted a Ramadan webinar discussing the medical and spiritual benefits of Ramadan, while Mufti Abdur-Rahman Mangera hosted another webinar later in Ramadan on maximising one’s time in Ramadan. 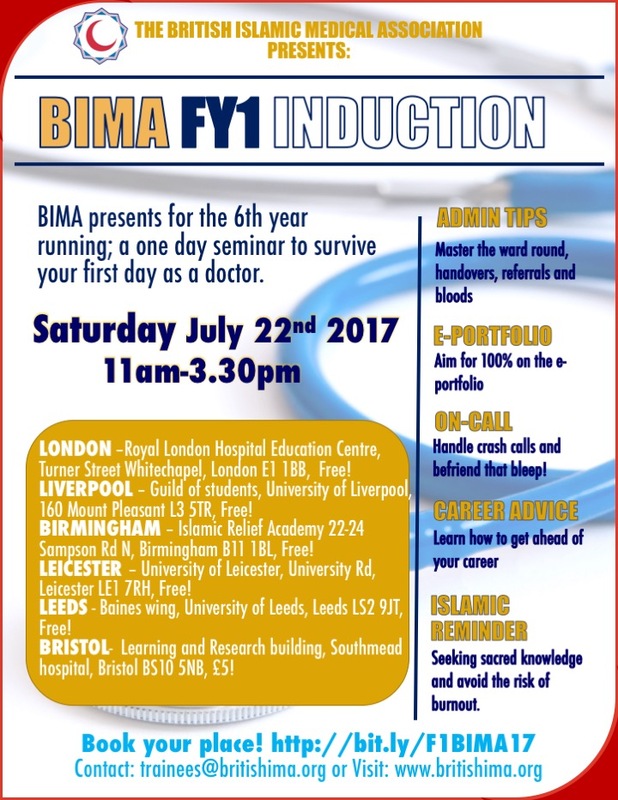 The highly successful ‘BIMA F1 induction’ event is back! This year, our events will take place on Saturday 22 July from 11am – 3.30pm in the Midlands, London, North West and South West! Delivered by current foundation doctors who have excelled through training, this is a must for all newly-qualified doctors about to start work this August. Learn about basic laws of fasting, the spiritual and physical benefits of Ramadan, and a chance to ask questions with the speaker. Dr Shaykh Rafaqat Rashid is a traditional Muslim scholar, GP and professional trainer and educator. He is an academic in the field of Islamic medical ethics and medical law, and is also a honorary lecturer at the University of Leeds. Firstly this month, a study published in the BMJ Open Diabetes explored the behaviour of patients with type 2 diabetes that chose to fast during Ramadan. In preparation for Ramadan, our teams across the UK held Safer Ramadan sessions to improve the general public’s understanding on fasting in Ramadan with diabetes. This was an opportunity for attendees to take part in an interactive discussions on this important condition just before Ramadan. Join us for BIMA Professional Development team’s first Ramadan reminders webinar, discussing the medical and spiritual benefits of Ramadan as well as the essential Fiqh rulings surrounding the month. The webinar will be delivered by Shaykh Dr Rafaqat Rashid, a traditional Muslim scholar, GP and professional trainer and educator. He is an honorary lecturer at the University of Leeds and an academic in the field of Islamic medical ethics and medical law. The Ramadan Initiative is one of BIMA’s many successful community projects. The project’s aim is to increase awareness amongst healthcare professionals on safe and effective prescribing for Muslim patients who fast during Ramadan. Our team of consultants, GPs and pharmacists have developed Powerpoint presentations (for hospital or GP settings) for teachers to deliver across the whole country in the weeks leading up to and during Ramadan. 1. The North West region hosted a health fair at the UKIM Khizra Masjid. Over 500 people attended to check out 25 stalls including: free health checks, information from local CCGs, stalls from Cancer Research UK, Macmillan Cancer Support, and the local hospital palliative team, the “Eye Pod” from RNIB, and various health care professionals who volunteered their time to help the community. 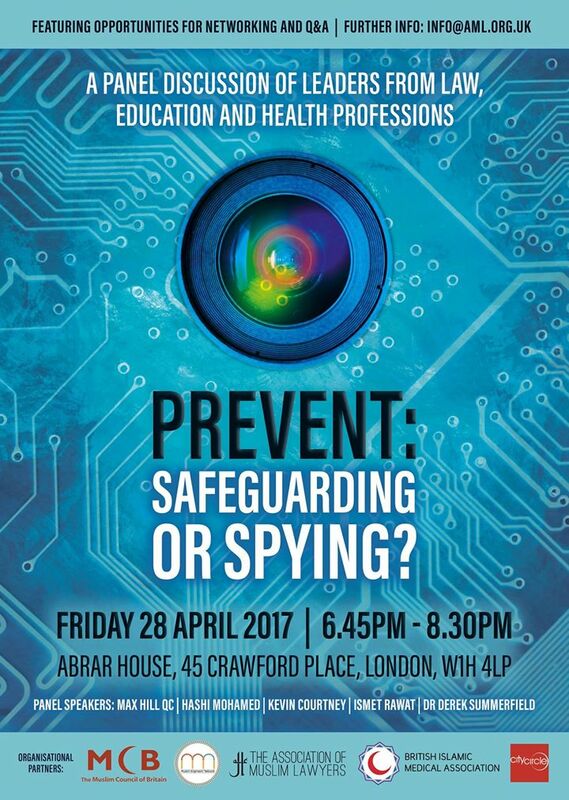 BIMA London – Prevent: Safeguarding or Spying? We are collaborating with the Association of Muslim Lawyers (AML), Muslim Engineers’ Network, The City Circle, and the The Muslim Council of Britain on the topic of Prevent: Safeguarding or Spying? 1. BIMA Yorkshire & Humber, in association with Leeds Muslim Medics, hosted an ‘Excelling as a Female Doctor’ event at the University of Leeds, where female doctors from various specialties spoke about the challenges and motivations of female Muslim doctors. Firstly this month, a study in the American Journal of Infection Control looked at vaccine compliance and parents’ stance on childhood vaccination. The study found that 85% of the Muslim parents surveyed support vaccination and were significantly more likely to be pro-vaccination than other parents from different religious affiliations. BIMA North West held a very successful CPD seminar on ‘What Happens After Death’ at the European Institute of Islamic Sciences in Oldham with over 150 attendees.